When Gurgaon Foodie Karan Bhatia mentioned to me about Rasoi on Wheels (RoW) at an event, I was intrigued to say the least. Here is a catering company that is going beyond commerce and is reaching out and feeding the underprivileged. I was curious to know how they manage it and yet remain profitable so that I can write about it and maybe more of our community will think of doing such things. Manika Badhwar, the Gurgaon Foodie community member who is spearheading this tells me that the focus is on providing hygienic, packed, nutritious & tasty meal boxes for the underprivileged people. “We have fed over 9000 underprivileged people in the last 20 days”. So how does it work ? RoW has a kitchen that makes and packs these food packets. Then these are either sponsored by RoW themselves or by kind benefactors. Their minimum quantities are 100, and they even guide as to where these can be disbursed. “We started thinking we would do this only for navratras but people came forward with open hands and said something like this has never been done and they have felt amazing giving these boxes and the people special while receiving them”, says Manika. The boxes available are Dal Rice Pickle (Rs 25), 4 rotis dal pickle (Rs 30), Chana with rice, pickle (Rs 30), and Aloo, 4 puris, halwa (Rs 35). The packaging is in sealed containers. 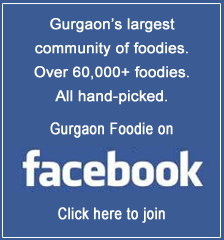 This is a great initiative which can easily be supported by Gurgaon Foodie community. Rather than lavish parties on birthdays, we can instead feed others and spread foodie happiness around. I will make a start by advance ordering 100 packs of aloo poori halva for underprivileged children for my son’s birthday.